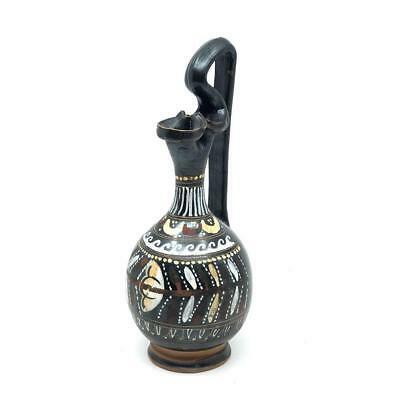 Seller: sandsoftimedc_com (425) 100%, Location: Washington, District Of Columbia, Ships to: Worldwide, Item: 153026715264 A gaily decorated South Italian Epichysis displaying the delicate, colored floral ornamentation on a black ground and refined shape typical of pottery from the Apulian site of Gnathia (modern-day Egnazia on the Adriatic coast). It was designed to hold small quantities of precious liquids and thus is usually associated with the dispensing of perfumed oils rather than as a drinking vessel. Gnathian pottery reached the height of its popularity in the mid to late 4th century B.C. where the taste for this decorative style, which often imitated the kind of closely worked motifs seen on metal luxury vessels, led to its being imported throughout the Mediterranean, even as far as Egypt. Dimensions: Height: 6 3/4 inches (17.14 cm) Condition: Handle repaired otherwise intact and in very good condition overall. A most charming example. Provenance: Private Californian collection, acquired from the London Art Market, prior to 1999. Popularity - 140 views, 0.4 views per day, 344 days on eBay. Very high amount of views. 0 sold, 1 available. 140 views, 0.4 views per day, 344 days on eBay. Very high amount of views. 0 sold, 1 available.